You know all those stranger-than-fiction news headlines detailing the bizarre exploits of someone identified only as "Florida man"? Imagine that all of those headlines referred to a single person, and that this person is superhero who causes mayhem wherever he goes. 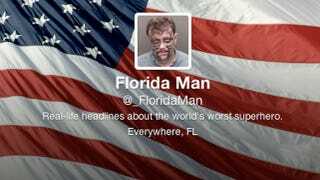 Twitter account @_FloridaMan collects the wackiest "Florida man" headlines, creating a chronology of a superpowered guy who just can't win. Looking over this list, though, I think the account creator has it wrong. Florida Man isn't a superhero; he's the world's saddest supervillain. Even when he sets his sights on something as low as a wedgie, he's bound to be defeated.